If God had wanted to truly tempt Eve in the Garden of Eden, She’d have hung these from the trees instead of apples… Ohh la la… “Charlotte Olympia Twist Sandals” absolutely to die for! Posted in • shoe fetish and tagged charlotte-olympia on January 14, 2015 by aubadegirl. Posted in • shoe fetish and tagged charlotte-olympia on December 20, 2014 by aubadegirl. Hello Kitty-Kat! 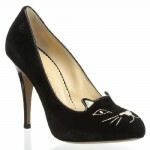 “Charlotte Olympia Kitty Pumps” in beautiful suede are sure to satisfy your feline affinity and make your feet purr! Posted in • shoe fetish and tagged charlotte-olympia on November 7, 2014 by aubadegirl.